On January 23, 2019 local time, President Emmanuel Macron of France met with State Councilor and Foreign Minister Wang Yi at the Élysée Palace in Paris. Emmanuel Macron asked Wang Yi to convey his sincere greetings to President Xi Jinping and expressed that the French side attaches great importance to France-China relations and looks forward to taking the 55th anniversary of the establishment of diplomatic relations between the two countries as an opportunity to intensify high-level exchanges, deepen cooperation in economy and trade, investment, nuclear energy, aviation and other fields, and increase exchanges in culture, education and youth with the Chinese side. Chinese enterprises are welcome to develop in France. The French side is willing to work with the Chinese side to strengthen communication and coordination in international affairs and jointly safeguard multilateralism. 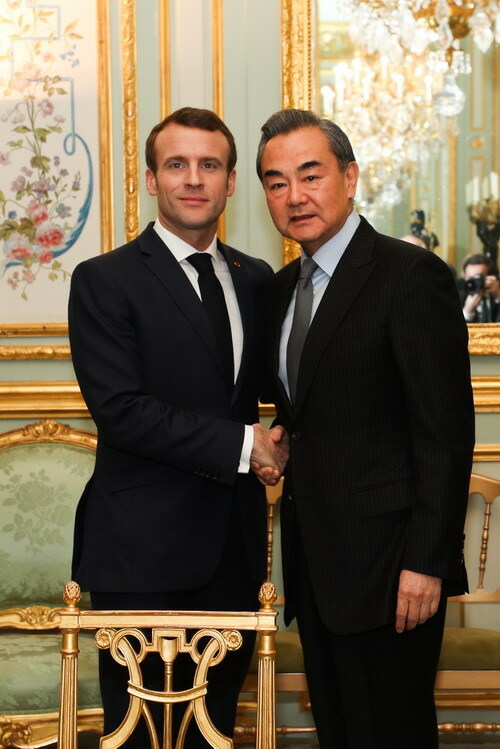 Wang Yi conveyed President Xi Jinping's warm greetings to Emmanuel Macron and expressed that since Mr. President's successful visit to China a year ago, various consensuses reached by President Xi Jinping and Mr. President have been steadily implemented, with positive results achieved from cooperation in various fields, showcasing the high level of China-France comprehensive strategic partnership and the huge potential for cooperation between the two sides. We will celebrate together the 55th anniversary of the establishment of China-France diplomatic relations in 2019. The Chinese side is willing to work with the French side to intensify high-level exchanges, enhance cooperation in such fields as nuclear energy and innovation and cooperation within the framework of the Belt and Road Initiative, strengthen communication and cooperation in multilateral agendas including climate change, jointly safeguard the rules-based multilateralism, and maintain the contemporary international system with the United Nations at the core, so as to continuously inject new connotations into China-France comprehensive strategic partnership. Wang Yi stressed that China's door will open wider to the world. The Chinese side is willing to provide a sound environment for foreign enterprises, including those from the French side, to invest in China. 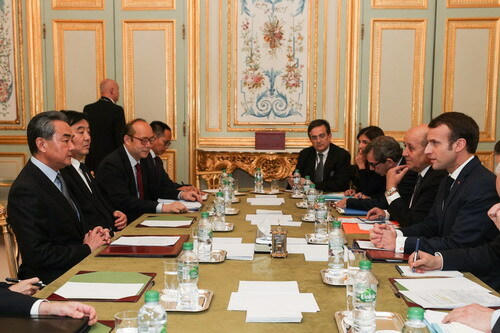 Wang Yi travelled to Paris on January 23 to hold the 18th session of the consultation of the coordinators for the China-France Strategic Dialogue with Diplomatic Adviser to the President of France Philippe Étienne. During his stay in Paris, Wang Yi will also hold talks with Foreign Minister Jean-Yves Le Drian of France.